Open house party for New Year’s Day calls for an exceptionally delicious dip! Many wonderful “lucky” dishes interspersed with a new Lucky Dip for a healthy New Year! This was a success, everyone was bringing their cracker over for a taste, many tastes, many smiles. Serve this savory spread with crunch bread or crackers. If you can’t find Asiago Cheese, substitute with Gruyere or Swiss Cheese. This is a Coking Light recipe, I switched the low fat for full fat mayonnaise and sour cream, also Gruyere cheese for Asiago Cheese. Nettie! This dip looks and sounds freakin amazing!! Need to make this ASAP. There is something about dipping into hot cheese containing bacon that just makes my tummy happy!! Well done!! This caught my eye on Community Table. The picture just about had me drooling! 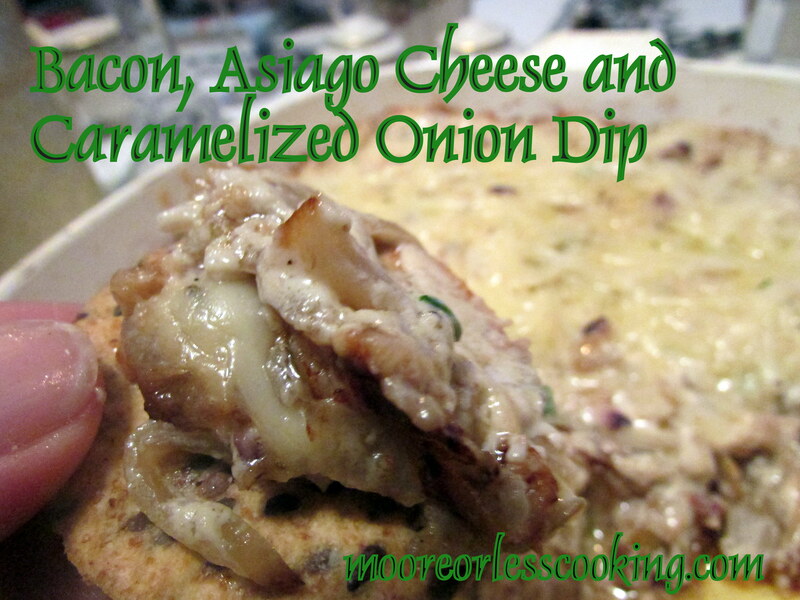 Then I saw bacon and my favorite cheese, asiago, and couldn’t pass this yummy looking dip up. Of course the caramelized onions didn’t hurt either! Thanks for the great recipe!